Radha Kund, 2017.03.18 (Vishakha Dasi for Vrindavan Today) Growing up I often found myself questioning what love really is. I used to annoy my mother with judgemental comments during television programs and films. My sweet mother would tell me to stop thinking so much and just enjoy the movie, swearing never to watch anything with me again. One example of a song that I found upsetting is Bruno Mars’ “Grenade” in which a man basically tells a girl he would allow his body to be exploded into a million pieces for her, even though she “would not do the same” for him. Does he live in a war zone, I thought, that catching a grenade for her is something she really needs? Or more likely, is he just being a manipulative kook? What passes for love in pop culture, I felt, was a sorry excuse. Sadly, the love we find in everyday life (and in ourselves) can be equally disappointing at times. But of course, that didn’t stop me from looking for it! It was only years later – long, in fact, after entering the Gaudiya Vaishnav path and moving to Vrindavan – that I started learning what love really is through the Narad Bhakti Sutra. Vaisnavacharya Chandan Goswami of the Shri Radharaman Temple has written a beautiful commentary on the Narad Bhakti Sutra called Way to Love. When, in his infinite kindness, he blessed me to help a little with its publication, the unanswerable questions in my heart started to receive answers. But before sharing some of the nectar from this beautiful and revolutionary text, I want to share how Sage Narad, the son of Brahma and wandering kirtaniya of the heavens, received the direct experience of that ultimate love of Braj. 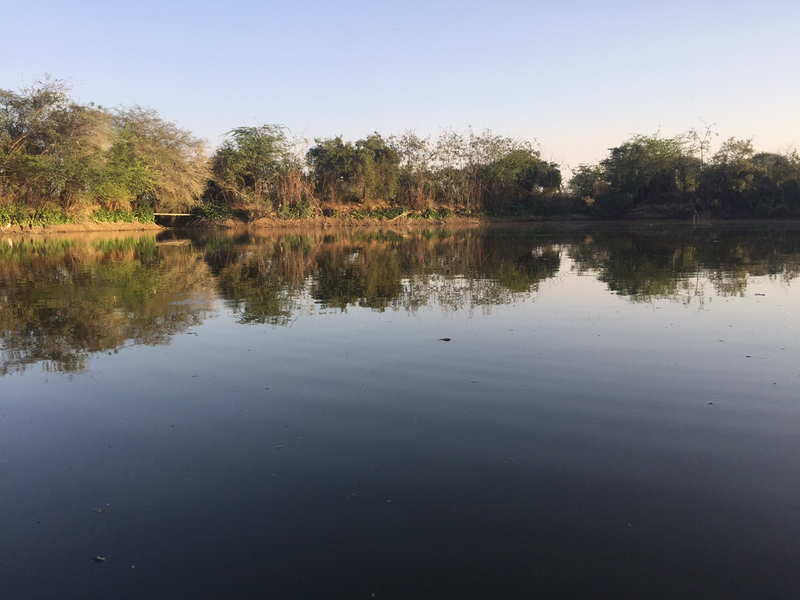 And his story revolves around the beautiful Narad Kund. Across the parikrama marg from Govardhan’s Kusum Sarovar, through a sandstone gate and down an earthen path, lies the beautiful Narad Kund. The wooded area around the Kund is very peaceful, far enough from the parikrama marg to be totally free of blaring horns and passers-by. 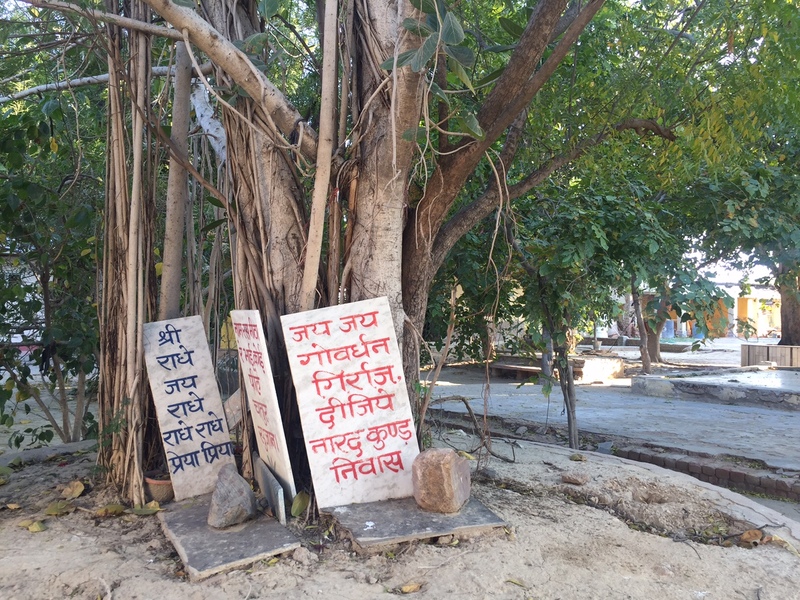 Each time I’ve been to Narad Kund, only a couple of Brajwasis could be seen in the beautiful ashram, including one elderly Babaji chanting Radhe Krishna Krishna Krishna Radhe Radhe, Radhe Shyam Radhe Shyam, Shyam Shyam Radhe Radhe – to the soft beats of the dholak. The ashram is clean and intelligently developed; still close to nature and full of many large, old trees. The new temple hall is very large and well-constructed, yet it blends in with its surroundings almost to the point of being unnoticeable. There are also a few simple rooms for the monks, and a small gaushala. The kund (lake) itself is teeming with life! Sitting on the bank for a few minutes, you can see chubby black ducks and various other chirpy, happy water birds, kingfishers and turtles, lots of green parrots, and even water snakes! 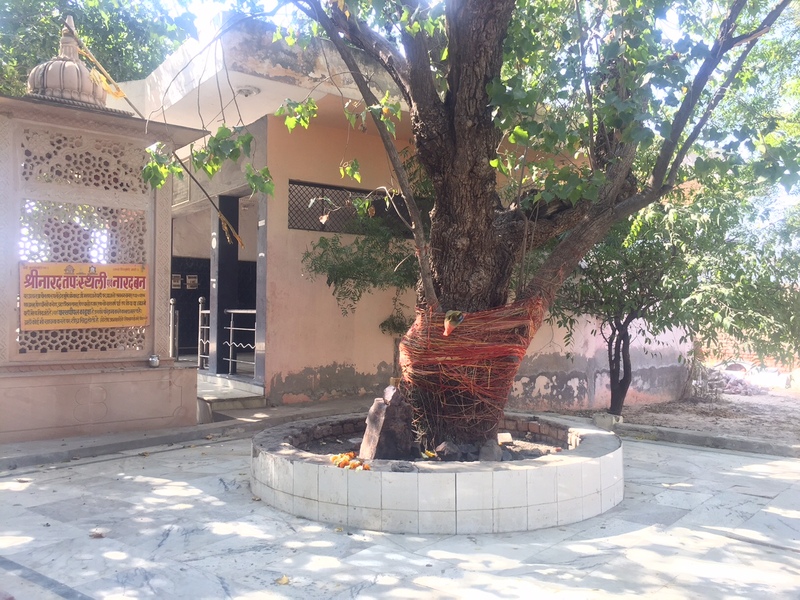 There is also a special tree here called the Paaras Peepal, said to be the fifty-first grandson of a tree that lived here during Sage Narad’s time, and which grows four different types of flowers on its branches. Sage Narad himself resided at this very spot, and he is said to live here still, in an unseen, spiritual form. Several important incidents from Sage Narad’s life took place at Narad Kund. 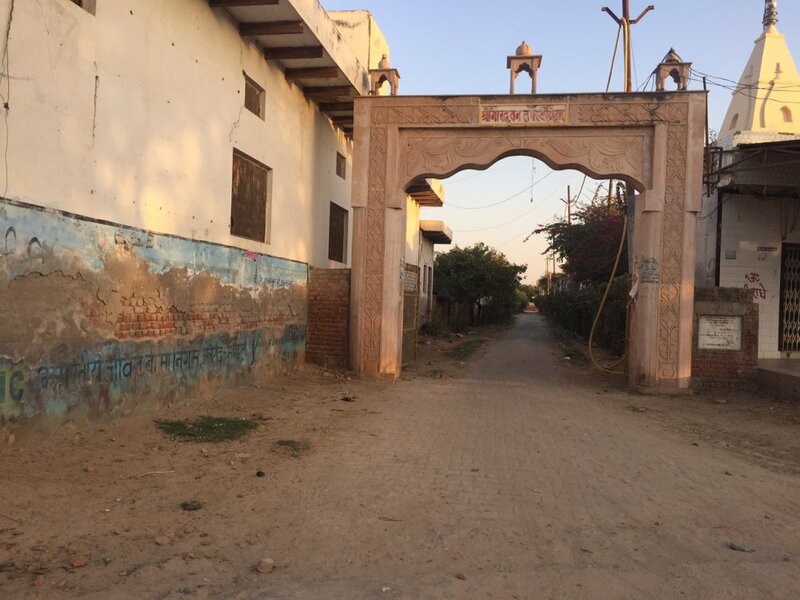 It was here that Dhruv Maharaj received diksha from him, and it was here that Prahlad and his mother took his shelter. In fact, according to the ashram’s pamphlet, Prahlad was born at Narad Kund. According to the Vaishnav traditions of Braj, the highest form of love is found in the hearts of Shri Krishna’s lovers – the gopis – in His eternal Abode, Vrindavan. Wishing to experience that ultimate state of love, Sage Narad approached his guru and father, Lord Brahma, for help. Several scriptures describe Sage Narad’s journey to Eternal Vrindavan. The Padma Puran, Patal Khand, tells how Brahma took Narad to Govardhan. There, Brahma made Narad bathe in a lake called Amrit, which is understood to be Kusum Sarovar. As soon as Sage Narad bathed in that lake, he was transformed into a beautiful woman. Suddenly, many other divinely beautiful young women surrounded him, and began asking him questions. Narad did not know what to say. How had he gotten there? How had he become a woman? It all felt like a dream! Lalita Sakhi told him that he had reached Vrindavan. Then she and the other sakhis took Narad to meet Shri Radha and Krishna. In the form of a gopi, Narad remained with the Divine Couple for an entire year, immersed in the ecstasy of their love. Then Shri Radha took Narad back to the same lake, and asked him to bathe in it again. The sage was transformed back into his previous form as Narad. From that day forward, Sage Narad remained absorbed in Vrindavan, and constantly sang about the great secret he had experienced. The Padma Puran goes on to tell how Sage Narad approached Lord Shiv to learn about the path of love for Radha and Krishna. Mahadev then revealed the mantra by which Shri Krishna is worshipped. He also told Narad the meditation for this mantra. You should remember Shri Krishna seated next to his Beloved, on a throne in the forest of Vrindavan. The form of Krishna you should meditate upon has two arms. His raincloud-dark body is wrapped in an elegant yellow garment. His chest is embraced by a garland of forest flowers, and his head is adorned by a peacock feather crown. His face is lovelier than millions of moons, and his eyes are rolling with the intoxication of love. He wears a single karnikar flower in his ear, and a bindi on his forehead, which is anointed with fine sandalwood paste. His earrings shine like the morning sun, and His cheeks glitter with drops of perspiration. His eyes are riveted to His Beloved’s lotus face as He looks at Her from the corner of His eye and raises a single eyebrow. His handsome nose has a pearl nosering, and his lips are like ripe bimba cherries shining in the moonlight of his teeth. 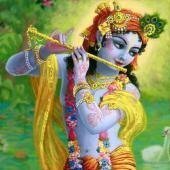 His arms shimmer with beautiful arm-bands, bracelets and rings inlaid with precious gems, and in his left hand he holds the flute and a lotus. His waist is encircled by an attractive scarf and a string of flowers, and His feet shimmer with beautiful anklets. He is very agile and eager to please His Beloved with an offering of romance. Meditate in this way on Shri Krishna, who is laughing with his beloved and is repeatedly making her laugh. Then you should remember Shri Radhika, who is seated at his left side. She wears a blue dress upon her lovely body, which is bright as heated gold. Her face is like a lotus blossoming with a great smile, and it is half-covered by the edge of her garment. Her eyes are transfixed on the face of her Lover, as the chakori bird beholds the moon. With her thumb and forefinger she gently feeds her Lover a betel-leaf wrap (paan). Her lovely, large breasts shimmer with the pearls of her necklace, and below her slender waist, her wide hips are adorned by a chain of tiny bells. She wears beautiful earrings, armlets, rings and bangles set with precious jewels, with tinkling anklets on her delicate feet. The essence of beauty, her body, is bewitching; captivating in every limb, she drowns in the ocean of joy. She has just crossed the threshold of youth, and she is easily pleased. Oh best of Brahmins, Shri Radhika is surrounded by her wonderful friends (sakhis) who are similar to her in age and qualities. They always serve her with fans and yak-tail whisks. The chaatak bird drinks only rain that falls directly from the raincloud. It rejects all other water [even though the rain is its source]. Abandoning the lake, the river and the sea, the chaatak either dies or makes its impassioned appeal to the clouds. In the same way, you should always pray to your Beloveds, saying, “Please be my shelter!” You should always seek your Beloveds’ happiness, and the happiness of those who are their own, especially the Guru. Likewise, avoid displeasing them. I, who have sought their refuge, will explain how they are pleased. Thinking, “the Divine Couple will surely deliver me,” you should have firm faith in them. You should pray, “Oh my Beloveds, you destroy the fear of those who take your shelter. You are the saviors of your devotees from this worldly existence, and from the illusion of friends, children, home and family. Whoever I am, whatever I have in this world and the next – all that I have dedicated today at your lotus feet. I, a sinful person, I have given up all means to save myself. There is no other way for me; only you are my shelter. Oh Lover of Radhika, in thought, word and deed I am yours. Oh Beloved of Shri Krishna, I belong to you alone. You both are my refuge. Oh jewel-mines of compassion, I seek your shelter. Please bless lowly me with the chance to serve you.” Thus muttering quietly this prayer of five verses, with a desire to serve Them, remain immersed in Shri Radha and Krishna’s remembrance. You should look upon yourself as one amongst them [the sakhis] who is charming, who is endowed with beauty and youth, who is a beautiful young woman, who knows many crafts and arts, who is fit for Shri Krishna’s enjoyment but who is averse to enjoyment though solicited by Krishna, who is the follower of Radhika, who loves Radhika and who is devoted to serving her, who loves Radhika even more than Krishna, and who, through love, day by day brings about the union of the Divine Couple, and who is extremely happy due to the pleasure and joy of serving them. In this way one should, beginning with the early part of the day till late night, offer service to them in Vrindavan. Delighted, Narad circumambulated Mahadev and bowed to him again and again. Then he proceeded to Vrindavan. When Vrinda Devi saw Sage Narad, she offered her obeisance to him and asked why he had come. In supremely charming Vrindavan, which is adorned with many beautiful kunjas (forest havens) is a house adorned with divine gems, in an arbour of desire-yielding trees. There the Divine Couple lie sleeping in each other’s arms. Later by my orders, the birds awaken them. Their deep embrace brings them great joy, and they are frightened of losing this closeness. They have no desire at all to arise from the bed. But they are forced to do so by the repeated entreaties of the parrots and the mynah birds. Vrinda Devi went on to reveal in detail the entire ashta-kalin-lila (lilas throughout the day) of Eternal Vrindavan. Having received the teachings of Lord Shiv and Vrinda Devi, and having tasted the love of Eternal Vrindavan himself, Sage Narad resided at Narad Kund, immersed in the bliss of his Beloveds’ lilas. Although he was relishing the supreme love of Vrindavan for himself, Sage Narad wished to share that bliss with the souls of this world. And so he wrote his treatise on love, the Narad Bhakti Sutra. What was Sage Narad’s message to the world? In part two of this series, we will begin to explore Sage Narad’s book of love.